What do I mean? Am I saying that no one should be challenged for ever-shifting stances on issues? Am I saying that inconsistency is a virtue? No, I’m not trying to say either of those things. We’ve all seen a candidate in a debate, or a in political advertisement, painted a certain way or pigeonholed for comments or stances taken years before which may have changed in the course of a decade or more years of experience We’ve all heard the accusations of hypocrisy the moment someone changes their mind. Civility will ask us to rethink our knee-jerk reactions to those shifts in people’s thoughts and conclusions. I mean really, have none of us moved from more conservative to liberal or more liberal to conservative views in our religious beliefs or political ideas? Have we not experienced our own selves adapt, change and subtly shift through the years in various ways? Have any of us learned or experienced something that changed our way of thinking? It’s uncivil to brand that in another person as inherently hypocritical or inauthentic. 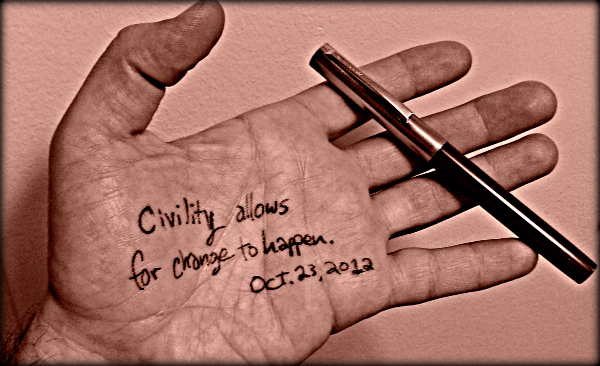 Civility allows for change. Civility is not a closed, predetermined response to someone, but it allows for some growth, some adaptation and the cumulative effect of years of discourse and experience. This entry was posted in October 2012 Civility and tagged adaptation, change, Civility, experience, growth.